Transcription services are used in business where there is a recording done like conferences, seminars which needs to be converted into text forms. Movies are also transcribed to allow for further translation, subtitling or voice over etc. We deal in all domains and industries (general, legal, medical and technical, entertainment). 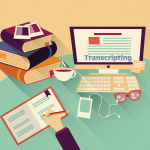 To guarantee a high accuracy for all transcripts, we hire our resource pool from all variety of industry backgrounds. They possess exceptional linguist’s skills and have an eye to detailing. They work on the files dedicatedly and proofread before submitting the files. We also take care of the confidentiality of the files; all your projects are safe with us. Shan Singapore’s team of native transcribers works efficiently and provides the transcriptions in the necessary file formats depending upon the end use of the file.